“Pair” plasmas are of interest due to their unique plasma properties such as the absence of Faraday rotation and parametric decay, enhanced nonlinear Landau damping, and solitary-wave behavior. They are also important in astrophysical settings such as at the poles of neutron stars. They are predicted to have many novel properties. We are participating in an experiment to make the first studies of a simultaneously confined pair plasma. 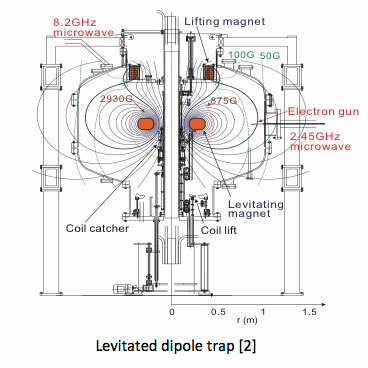 We are participating in a collaboration to confine and study a pair plasma in a superconducting levitated magnetic dipole trap [1, 2, 4]. The effort is led by Thomas Pedersen (MPIPP, Greifswald, Germany). The experiment will be done at the intense positron beam at the Munich research reactor. The goal is to create pair plasma with densities ~ 1012 m-3 and temperature ≤ 0.5 eV. The requisite bursts of ~ 1012 positrons for these experiments could be created using the multi-cell trap (MCT) that our group is developing. 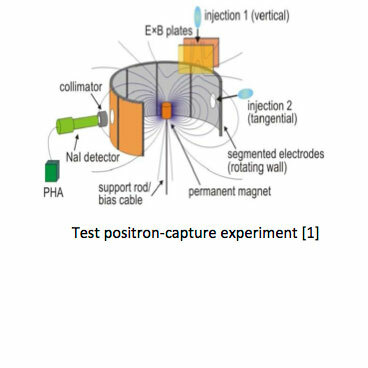 Alternative confinement schemes proposed for such a pair plasma experiment include use of a magnetic mirror  or a Penning-Paul trap . H. Saitoh, New J. Phys. 17, 103038 (2015); , J. Phys. Conference Series 505, 012045 (2014). Z. Yoshida, Pl. Phys. Cont. Fusion 55, 104018 (2013). V. Tsytovich, Comm. Pl. Phys. Cont. Fus. 4, 91 (1978). T. S. Pedersen, New J. Phys. 14, 035010 (2012). H. Boehmer, Phys. Plasmas 2, 4369 (1995). R. G. Greaves, Non-Neutral Plasma Physics IV, F. Anderegg, et al., eds. (AIP, NY, 2002), p. 10. During operation of the Multi-Cell Test Structure (MCTS), we discovered an unexpected phenomenon: a plasma spanning two Penning-Malmberg cells with non-coinciding axes will execute a non-circular orbit dictated by the average of the diocotron drifts in each cell. These orbits are enabled by fast axial bounce motion across the two cells (so-called “bounce-average” dynamics). The bounce-average orbits (also referred to as “competing-drift orbits”) were discovered during the process of transferring plasma from the large-diameter master cell into one of 3 small-diameter off-axis storage cells. This process is shown in the figure to the right. In panel (a), we begin with a plasma (blue line) confined on the axis of the master cell. In panel (b), we use autoresonant diocotron excitation to move the plasma across the magnetic field to the location of the storage cell. Finally, in panel (c), we open the gate separating master and storage cell, allowing plasma to stream between the two cells. At this point, plasma particles bounce rapidly back and forth between the master and the storage cell. Because plasma motion perpendicular to the magnetic field is relatively slow, the diocotron drift of the plasma is an average of the separate drifts in each cell. While the diocotron drift in a single cell traces out a circle aligned with the cell axis, the bounce-averaged diocotron drift traces out an approximately elliptical shape (shown above, within the boundary of the storage cell). Electron plasmas, under certain conditions, obey a set of equations which are directly analogous to the equations governing 2D ideal fluid dynamics. This analogy allows us to study 2D vorticity dynamics with electron plasmas, offering distinct advantages over traditional fluid experiments such as water tanks. Specifically, we focus on the case of a coherent vortex subjected to strong, rapidly imposed external shear and strain flows. Vortex dynamics experiments are conducted in our lab using the 8-Segment Trap. 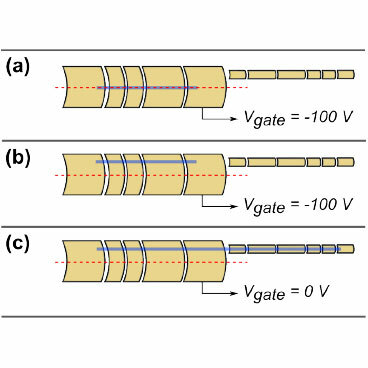 We use the segmented electrode to apply external ExB flows to our electron plasmas. The resulting dynamics are analogous to that of a coherent fluid vortex subject to ambient flows. Particularly, we focus on sheared and strained flows; the latter case is shown schematically in the leftmost panel above. In response to the applied flow, the vortex may shed filaments (top panel above), or experience destruction via elongation into a filament (bottom panel above). 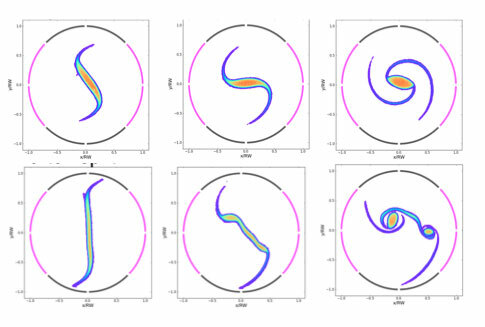 If the applied flow is removed while the filament is still relatively thick, the vortex core remains intact and winds up the spiral arms (top panel to the right), whereas if the filament is thin enough it can undergo a Kelvin-Helmholtz instability and roll up into two daughter vortices (bottom panel to the right). This research is applicable to various quasi-2D flows such as that of planetary oceans and atmospheres.